Farmers’ markets around the state will be celebrating Maine Farmers’ Market Snapshot Week from August 5-11th. Snapshot Week comes during peak farmers’ market season, when the markets are bursting with beautiful summer products, and shoppers can enjoy some of the best weather of the year. To celebrate, many markets will be offering special events, including giving away temporary tattoos and stickers, hosting activities and contests, offering taste-testings, and asking shoppers to join in by sharing stories and photos on social media. During Snapshot Week, markets ask their patrons to join them in supporting the local foods movement by sharing their farmers’ market photos and stories on social media as well. Using the hashtags #MESnapshotWeek and #LoveMaineMarkets, shoppers can tell the story of their favorite farmers’ market through photos and comments. 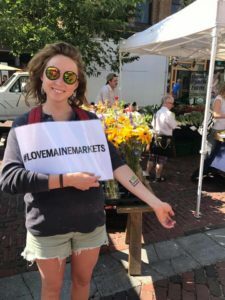 Maine is ranked second in the nation in terms of consumer commitment to local food, and 5th in the nation for the number of farmers’ markets per capita. USDA research has shown that farms that sell directly to consumers are more likely to stay in business, making farmers’ markets critical to the sustainability of small farms. With more than 120 summer farmers’ markets, Maine shoppers have many options to find fresh food and support their local farmers and food producers. Make sure to visit a participating market for Maine Farmers’ Market Snapshot Week, August 5-11, to get a taste of what Maine’s farmers’ markets bring to the table!